We’ve spotted a new glamping and cool camping trend and it’s going on high up in the canopy just above our heads. Yes, it’s the emergence of amazing treehouse designs which are being developed to help enhance our time outside in a unique and fascinating way. We’ve already shared some of our inspirations with you, but now it’s time to look at what’s new and vibrant in the exciting market of treehouse designs, for those who want to build their own, or simply stay in one in the future. So, why do we all get such a thrill from treehouse designs and other unique structures? Is it because it allows us to reach those places we’ve always wanted to be since we were climbing trees as kids? Way up in the canopy with the birds where few could see us, giving us a vision of what it would be like to fly or be a part of the woodland? Or is it because it’s comfortable camping, allowing us to enjoy the outdoor life? Whatever the reason, it seems we are all hungry for treehouse designs we can build in our own back yards, our glamping and cool camping businesses, or simply stay in somewhere during our next short break holiday. But what are the new treehouse designs on the market and what have ordinary people already done, which we can use for our own inspiration? 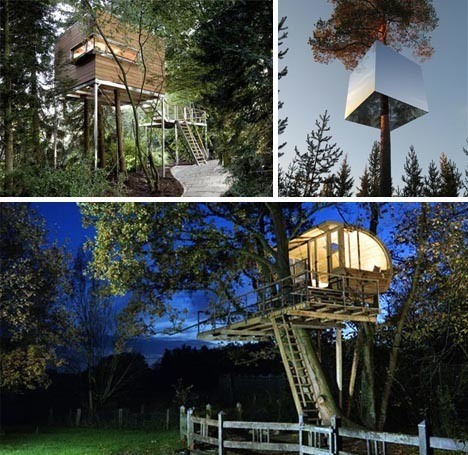 Whether you are using mirrored materials to help it blend into its surroundings effortlessly, or wooden cladding for more robust structures, it’s clear that in the world of treehouse design, the only limit is your imagination. We like this design as it fits with our environmental ethics. Although the space is sleek and robust inside, the outside is clad with natural materials in a chaotic and camouflaged way to make it look like something built by nature itself, giving it a sense of being at one with its surroundings. 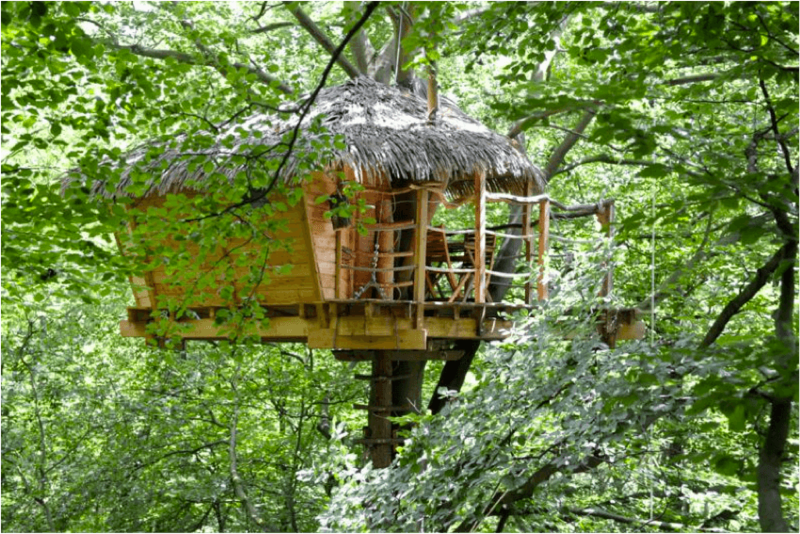 Something that you and I could… possibly… make in our own back gardens is a rustic treehouse. Here we can repurpose the materials we already have lying around to fit a structure around our daily needs. These are inspirational refuges from our daily lives, or somewhere we can pursue our hobbies, inspirations or plans for the future. We love this rustic design of treehouse. 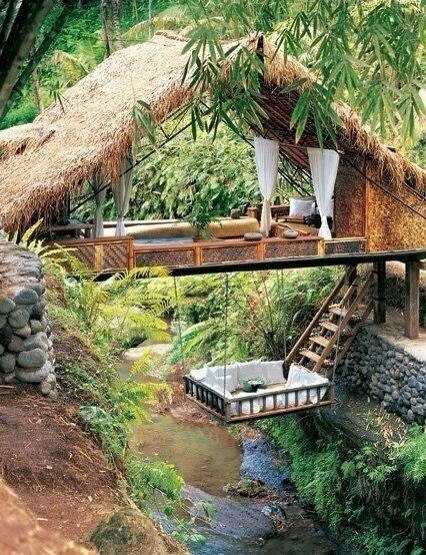 Can you imagine how relaxing it would be to stay in a space like this, with the only noise being the trickle of the stream below. Hopefully the local climate will be able to cope with such an open space and no walls, so this is definitely not a design for colder countries. So what do you do if you want to create your own design? Firstly, you have to get busy learning some carpentry skills. This will help you with the big build and the smaller adjustments necessary for this type of project. Invest in some easy-to-follow woodworking plans suitable for beginners and professionals, such as Ted McGraths home learning kit. This will get you started developing your skills and knowledge with wood. If you need more help there’s also Ryan’s Downloadable Shed Plans, that give you the fundamentals of shed building. All you’ll need to do is figure out the structure to raise your treehouse off the ground. Do you have any home learning suggestions to help those who want to create their own treehouse designs? Add them to the comments section below and lets get started!